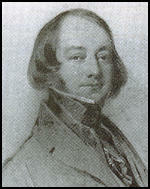 Thomas Lawless Ternan was born in 1790. The son of a Dublin grocer, he had fifteen full brothers and sisters. He joined the stage as an aspiring actor in 1808. He worked in Kent before touring the country. His acting was described as "forcible rather than finished". By 1833 he was playing leading parts but he was not considered a great actor by William Macready , the leading theatrical figure at the time. He wrote in his diary: "I do not like Ternan's mode of behaviour: it is difficult to say who will or will not be an actor, but I do not think this person in his private capacity will ever shed lustre on the theatrical profession. He seems to me opinionated, jealous and of course little-minded." Ternan's biographer, Claire Tomalin , has pointed out: "Macready took a poor view of both his talent and his character, and as a tragedian he was hampered by being short and stout." On 21st September 1834, Ternan married Frances Jarman. They immediately travelled to America where they toured for the next three years. On 26th February, 1835, he wrote to a friend: "Our success has been brilliant - indeed far more so than our most sanguine and best friends could possibly have anticipated. We played a short engagement at Boston lately, and the receipts of the theatre, for two nights, were much greater than even the Kembles had drawn, within the same period. We cleared there, in that time, upwards of $2,200, say £500 sterling. We are equally fortunate here, and the same in every town we have appeared in. we return to Boston on 11th March, to perform fifteen nights more, and I have no doubt a second engagement will be even more productive than the first. So great was the excitement on the last night we played there that the boxes were sold by auction, and double prices obtained in almost every instance." A daughter, Frances Eleanor Ternan was born in 1835. This was followed by Maria Ternan (1837) and Ellen Ternan (1839). After the birth of the third child the family moved to Newcastle upon Tyne, where Ternan became manager of the Theatre Royal, his wife was the principal actress. The three daughters also appeared in productions. In 1844 Thomas Lawless Ternan had a mental breakdown and entered the asylum at Bethnal Green. As Claire Tomalin , the author of Dickens: A Life (2011) has pointed out: "It was a grim place, and treatment of those with General Paralysis of the Insane - this was the diagnosis of Ternan's condition - was necessarily dreadful and humiliating. Since there was no cure, restraint was the only course available; some patients were kept chained in the early stages, when they might be violent or suicidal, though as the disease took its course this became unnecessary. In the last stage they became emaciated, incontinent, unable to feed themselves, with contracted limbs and bedsores; and so died, either of a fit, pneumonia, diarrhoea or exhaustion." Ternan died in 1846. I do not like Ternan's mode of behaviour: it is difficult to say who will or will not be an actor, but I do not think this person in his private capacity will ever shed lustre on the theatrical profession. He seems to me opinionated, jealous and of course little-minded. Our success has been brilliant - indeed far more so than our most sanguine and best friends could possibly have anticipated. We played a short engagement at Boston lately, and the receipts of the theatre, for two nights, were much greater than eve n the Kembles had drawn, within the same period. We cleared there, in that time, upwards of $2,200, say £500 sterling. We are equally fortunate here, and the same in every town we have appeared in. we return to Boston on 11th March, to perform fifteen nights more, and I have no doubt a second engagement will be even more productive than the first. So great was the excitement on the last night we played there that the boxes were sold by auction, and double prices obtained in almost every instance.